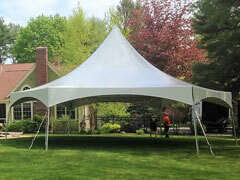 Busy Bee Jumpers offers a complete line of tents to meet all your needs! Whether you’re hosting a small gathering, a backyard wedding or a large corporate event – we have what you need! Browse our beautiful High Peak Tents listed below based the size you’re in need of. When you’re ready to place an order, call our office and we’ll take care of the rest! Having a small backyard gathering? 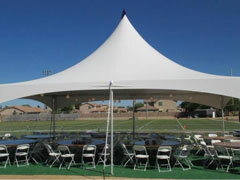 Check out our 20x20 High Peak Tents and Tent Packages which include tables and chairs for 40 people. We also have lighting and side walls which can be added to your package for an additional cost. 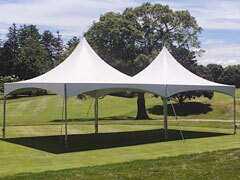 Check out our beautiful new 20x30 High Peak Tents and Tent Packages. Package includes tables and chairs for 60 people! 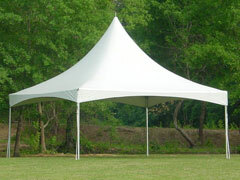 We also have lighting and side walls which can be added to your package for an additional cost. Whether you’re hosting a large party or need some extra space for the caterer, our 20x40 High Peak tents offer space for everyone! With packages including tables and chairs for 80 people, you’re sure to have a spot for every guest! We also have lighting and side walls which can be added to your package for an additional cost.